You'll finally achieve Tec Monkey status and be awarded the coveted black Technical Monkey shirt! 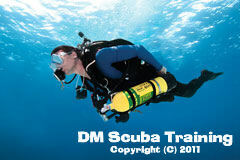 You'll use Tec scuba diving equipment including two stage cylinders. Stage cylinders can be supplied free of charge for the duration of the course. The pack includes a manual, dive planning checklist and dive planning slate. The optional Equipment Set-up and Key Skills video on DVD is a great tool to help you practice at home in between your Tec diving adventures. - 20 dives were made with enriched air nitrox deeper than 18 metres / 60 feet.